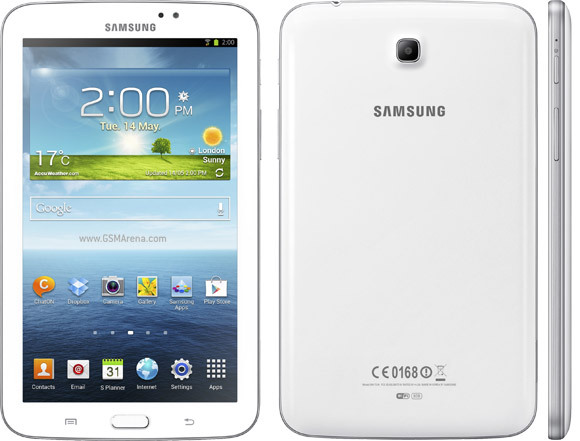 Samsung releases the third generation Tab in a 7-inch format and labeled it as the Galaxy Tab 3. Now, for me, that messed up my ideology on how to differentiate the Tab line to the bigger Note counterparts like the Note 8.0. Anyways, the new slate comes "thrift-shop" of upgrade and is pegged to mock the Google Nexus 7 in terms of pricing. And to roll down the specs, this upgrade might disappoint Samsung's frenzied fans. It borrows its design to the Galaxy S 4 and is somewhat lighter than its predecessor with its 306-gram weight. Other than that, the 1.2 GHz dual-core CPU, WSVGA (1024 x 600) TFT display, the 1GB of RAM and the 8/16 GB internal storage (expandable via microSD slot) seems like a blast from the Tab 2 7.0's past. This will however be powered by Android Jelly Bean out of the box. There's a WiFi version that'll come in May; and a 3G variant, that is fully equipped with calling features, just like the very first Galaxy Tabs, will be available in June.